Here is where I record the history of the each of my pets on my account as well as their character outline and background. Each profile is accompanied by a few pictures: eventually, I hope to have a gallery and fanart link for each pet. Why this page? Simple enough question to answer: I want to remember how I brought each new Neopet member into my tiny Neo-family here on the site. Not only does it help me keep a record of a sorts, it also allows me to appreciate how lucky I have been to have been allowed to adopt some of the pets I have. Without further ado, let me introduce you to the navigation bar on the right. The Neopets profiles are placed according to which account they are currently on. 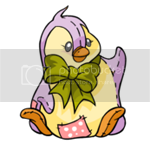 Clicking on the main Neopets picture on each profile will take you to that pets lookup. Started in April 2003, alagfalaswen is Axtar's first and main account. As Axtar's first ever pet, Yerenwen gets seniority status around the house, despite Jorgey's older age. No one challenges this though - Yerenwen's sunny and laidback personality ruffles very few feathers and the hands that sooth them back down are capable and strong. Initially born as a Blue Bruce (my favorite Neopets species), Yerenwen was painted Christmas on 7th February 2004 - my first ever dream-pet color. He happily remained Christmas through The Great Conversion (despite being auto-converted) and would still be one today if not for the release of the Chocolate Bruce color. Needless to say, a new goal for Yerenwen emerged. As Yerenwen was never to be a lab pet, this created quite the quandry, as Chocolate was a lab-only color. The random lucky event of my first (and only) FFQ solved that soon enough though and on 6th of March 2010, with an audience of loving friends, Yerenwen was painted Chocolate. 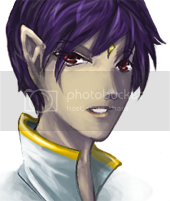 Fun fact: When I created Yerenwen, I wanted something that sounded vaguely exotic and...Russian. Clearly, I didn't have a very good idea of what a Russian name was like back then. Not that I'm complaining though - I like how his name just rolls off the tongue. 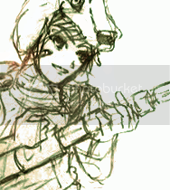 A native of Terror Mountain, Yerenwen was a snowboarding prodigy, best known for winning all five of Neopia's major snowboarding championships in Y8. He was also one of the few competitors able to perform back-to-back 1080s in a single run and land it. He favored spins and grabs, and constantly worked tricks such as the Sato Flip, McTwist and Mute into his runs. This, along with his personable character, made him a fairly major celebrity in the snowboarding world. It was not uncommon to spot him on Neopian magazine covers, with his distinctive blue-streaked hair and his river-rush-themed (his personal nod to that sporting event) board. An accident during the Valley Open Series qualifier rounds left Yerenwen in a critical condition for weeks. Despite recovering almost fully, the injury sustained effectively ensured that Yerenwen would not snowboard competitively again. It also left Yerenwen with a slight limp in his left leg, usually barely discernible unless Yerenwen is exhausted or the weather is bad. While laid up in the hospital, a kind nurse used to bake him cookies every week. Chocolate chip, banana, frosted negg, mint swirl...these were what helped him through the weeks of rehabilitation and the brief spells of despair. Wanting to do the same for others, Yerenwen turned his enthusiasm towards the kitchen, bag of flour and rolling pin in hand. Unfortunately, Yerenwen is as horrible at baking as he was good at snowboarding, which results in singed, mangled and downright dubious baked goods. Jorgey once remarked that anyone who ate Yerenwen's cookies ten days in a row probably wouldn't live to see the next day; this saying has become something of an urban legend around the House. Still, it's Yerenwen's goal to bake The Perfect Cookie one day. Culinary experiments aside, Yerenwen is pretty good around a cup of cocoa and even better at listening to problems. Whenever someone needs a listening ear, thoughtful advice and a hug or two, Yerenwen's the first one they head to and he never disappoints. His constant cheerfulness and easygoing personality never fails to put others at ease and make them feel a little calmer, a little more sure that everything will be okay. Despite the laid-back charisma, Yerenwen takes his role as the head of the House very seriously. Prior to Snowgnats and Jorgey's arrival, he, as the eldest, single-handedly raised both Freedom and Kaijirou even as he juggled competitions and practice time. Even now, he keeps a watchful eye on the state of all the households, ever ready to intercede should any problem crop up and threaten the comfortable peace that blankets his family. Cheer, responsibility and a infectious laugh. It's why everyone puts up with his (really, really bad) cookies. It's why everyone acknowledges him as the head of the House, always. Because Yerenwen is Yerenwen, and that's just all they need. The oldest in the family, Jorgey is -in a nutshell- haughty, blunt and sarcastic. Beneath her sarcasm lies depths of knowledge and with her sense of wanderlust and diving skills, she easily coaxes the ocean to yield up its secrets and jealously-hoarded possessions. 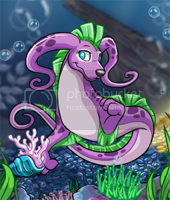 The fourth pet to join my growing Neopets family, Jorgey was adopted from the Avatar Chat boards some time during early 2005 where her owner was looking to pound her out. Despite her being a Yellow Gelert, there was quite the commotion for her back then due to Jorgey Hop, her aged snowbunny. Naturally, I was ecstatic to be selected as her new owner - aside from Hop, Jorgey was gorgeous, and she was the first girl pet I had. 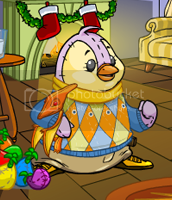 When I finally got the lab ray in 2008, Jorgey was the only unpainted pet I had, so I thought I'd try it on her. The first couple of goes gave her stat boosts. Then, one fine day, the lab finally coughed up its first-ever color change - Maraquan. Needless to say, Jorgey no longer visited the ray after that! special shoutout: To Mary for the Seaweed Bubble Shower! Not much is known about Jorgey's past or who she used to be before she came to stay at the house. Only Yerenwen knows, a little, and those scraps of information he wisely keeps it to himself. All that's known is this: It was a rainy night and she needed a roof to hide from the storm, walls to hide her from the world. A 'few days' became a few weeks, became a few months. As the season turned cold and then scattered into snow, Yerenwen asked and Jorgey grudgingly agreed to stay the winter as well. re The spring came and Yerenwen asked and Jorgey again agreed to stay a little longer and help clean up and tend to the gardens and watch Freedom, who was but a baby yet. Summer rolled slothfully in with the heat and sun, Yerenwen asked and Jorgey did the laundry with Kai and yelled when she was bombarded with spurts of cold water from waterguns wielded by Snowgnats and Kissy. Then when autumn came, Jorgey asked and Yerenwen happily agreed to accept Jorgey as another resident at the House. Wanderlust soon began to trickle in, but Jorgey had made her peace with the world and was all too willing to mine at the secrets of the deep again. She has always been an explorer, but where others scour the desert and the mountains, her respectful fingers graze the very floor of the sea. Instead of dusty terrain, eyes scour the colorful spectrum of coral. Skeletons of shipwrecks make for more wonderous caverns than anything the desert could offer. And the forgotten gleam of treasure, half-buried in history and the sea's sighs, are more precious than all the dubloons Krawk Island could offer. During her brief pauses in between journeys at the House, Jorgey can be blunt in giving her opinions and is sarcastic more often than not. Time has mellowed her out however, and knowing she has a place to which she could always return to has settled her and lent her a sense of peace she never thought possible. So Jorgey corrects and lectures the others, occasionally mocks Yerenwen's baking and help out with the chores. But each time she comes home, her bag is always heavier with small gifts Time forgot. And when she sets out again, her heart is lighter, burdened only with anticipation and thankfulness. One of the younger boys, Snowgnats loves gaming and has the trophies to prove it. His enthusiasm for games, especially slime wars almost always ends up in ruined furniture and stern lectures though. After Jorgey zapped Maraquan however, I decided to try my luck with Snowgnats. Initially, my goal to zap him into an Orange Grundo and customize him as a space ranger of a sorts. Well, Snowgnats went through a series of species-changing, hair-raising (and hair-losing!) and gender-swapping zaps, none of which were an Orange Grundo. He would still be zapped today if not for the Altador Cup in 2009 when Snowgnats turned into a Fire Kiko just after I decided I really liked Lamelle, the Kiko on the Lost Desert team. After giving him the Polarchuck Hat to wear, Snowgnats is the happy and energetic Kiko he is today, ever up for a game or two. In his own words, Snowgnats is a 'game nerd'. If it has consoles, he'll love it. If it has equipment, even better. Cards, pawns, dodgeball, paint bomber - if he can play it, you can bet he will. And he doesn't just love playing games - he's actually good at them. Having won several international tournaments in Darigan Dodgeball, Chia Bomber and Cloud Racers, Snowgnats is also currently the youngest Battlefield Legends pro in the gaming world. His peers aren't too surprised though - it's Snowgnats after all. He's particularly known for his fast reaction time and well-planned strategies. His aptitude and love for gaming doesn't translate well in the house though and, more often than not, hapless furniture take the brunt of his and Kissy's 'slime wars'. More than once, Jorgey has chased him around for the sliming of the sofa and various expensive vases and bookshelves. Yerenwen has given him a firm talking to and Kai helped build a 'game park' of a sorts outside. Yet somehow, every time Snowgnats gets caught up in a game of some sorts, furniture suffer. Snowgnats moved into the House when he was still fairly young. As he explained to the others, it wasn't really that big a deal - his old home got a little crowded and he was old enough to be independent anyway. So he thought he'd do the owners a favor and moved out with his huggy, Kissy to find his fortune in the wide, wide world out there. It turned out that fortune found him though when Yerenwen stumbled across him longingly eying the sandwich the older boy was eating while he was out one day. Turns out that Snowgnats hadn't thought much about Neopoints at all and hadn't eaten for awhile. Yerenwen promptly brought him back to the House, where he had dinner and just never left. Not that anyone's complaining though. If anyone feels restless, Snowgnats is always up for a game or two. Rarely ever tired or wiped out, Snowgnats constantly helps out where he can and entertains Freedom to keep him in a good temper. He's glad to help out where he can, when he can. After all, it's not often that one comes across his fortune so easily, especially with that big, wide world out there. Sportsman extraordinaire, Chubs is charismatic confidence personified. His chief goal is to break the Neopian run-record in snowboarding, which is currently held by Yerenwen. A while after I adopted Nefz, I began wondering if it were possible to adopt a Un-Converted (UC) Bruce as well. I did a little search to see if there were any UC Bruces that still retained the original sitting pose. Out of the three Bruces that weren't affected by the conversion, it became clear that the one remaining Bruce in the familar pose was the UC Plushie Bruce. I therefore decided to start looking around the PC in the hopes of finding such a Bruce to apply for. As 2010 came to an end without even the whisper of any UC Bruce going UFA, I finally decided to start a serious attempt to trade for one. During the purge, I caught the name 'Charice', and started the long trade upwards. During my trading attempts, I watched the PC for UC plushie Bruces that were up for trade. Eventually, I stumbled across Anne's board, where she had Chubs advertised as UFT. I fell in love with him, and pretty much waxed eloquent to Anne about his awesomeness. Shortly after that, I decided that I would not just trade up to a UC plushie Bruce - I'd trade up to Chubs, the UC plushie Bruce. Anne, amazing person she was, agreed to a name-swap if I were to be able to trade for another Bruce. During this time, I had traded Charice for a Pirate Krawk custom, which was traded in a 3-way of a sorts for Kaiishe, the UC Faerie Kyrii. After a while of trying to trade her (which included a trying experience when I accidentally traded for a scammed pet), I met Anna, who was looking for a Kyrii just like Kaiishe. After some discussion, Anna started trading up towards an offer Anne would like for Chubs, in order to trade for Kaiishe. In late July 2010, Anne surprised me with a Neomail, asking me if I'd like to adopt Chubs. After a lot of crazy spazzing, I finally got to adopt Chubs in August 2010. As I no longer needed to trade Kaiishe, I decided to trade her over to Anna to give her her own dream-pet. 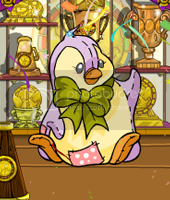 With the arrival of Chubs, my biggest pet goal was met and my Bruce troika completed. special shoutout: To Anne, for surprising me with Chubs - I'm still uber-grateful for the chance to bring him into my Neo-family. ♥ To Anna, thanks for being so patient and for loving Kaiishe as much as you do. Speed skating. Yooyuball. Dodgeball. Snowboarding. When it comes to winter sports, Chubs is your sportsman. Notorious for having his finger in many (sports) pies, Chubs is also famous for actually being good at the sports he plays. He's even served as a substitute player for the Terror Mountain Yooyuball team once in the 3rd Altador Cup, having done well in the local yooyuball circuit. If asked though, Chubs would admit that his favorite sport of the lot is snowboarding. He's currently the best on the circuit, with complicated runs and a speed that make him the favorite of the judges. His highest score is still short of the Neopian record in the sport though - an achievement still held by Yerenwen, who retired young after an unfortunate accident and runs the house Chubs lives in. Chubs has a little grudge against Yerenwen for that; not only is he technically second-best, record-wise, but his twin, Nefz idolizes Yerenwen and that doesn't help matters one bit. As to how Chubs even landed up staying at the House is a bit of a puzzle to all concerned. What had initially been a visit to his twin brother (who is at the Cave) had ended up with the athlete stubbornly dragging his many bags and training equipment into the spare room on the second floor, insisting he had to keep an eye on his brother and on Yerenwen, whom he will beat some day, darnit. Yerenwen had been delighted at the prospect of a new housemate, and while Jorgey was vocal in her disagreement, the equally gleeful looks on Snowgnats and Amastri's face ended the argument on Chubs' side. When not dealing with his issues of being second-best to his twin's idol, Chubs is charismatic and personable, with a healthy dose of self-confidence. His skills naturally ensures his fame in the sporting arena, and he is no stranger to interviews and photoshoots. He is well-read and comfortable with interviews, dispensing with false modesty even as he praises his opponents' techniques. While he may border a little on arrogant, he knows his own weaknesses and drills at them in practice. Contrary to Jorgey's belief, Chubs isn't much of a sore loser, knowing when to acknowledge when he's been beaten (by any other than Yerenwen). At last count, there are two official fanclubs dedicated to him, and one fansite of which Amastri is a unashamed member of. During the brief periods when he's in the House, Chubs doesn't hesitate to lend a hand when needed, and several lost travellers have been caught off-guard by two sporting legends packing supplies and maps for them. 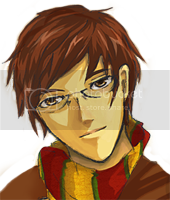 The younger household members adore him and he humors them by participating in their games and 'wars'. Jorgey and him constantly snark at each other, with the former rolling her eyes at 'the biiiiig sports star'. As for Chubs and Yerenwen? Well, the latter admires Chubs' skills and cheerfully tell others that he'll surely surpass him someday. Chubs himself is still doggedly striving towards that 'someday'. Axtar's first side account, lyserilia was opened in January 2006. A part of the House, the Playroom is where the younger children and their imagination have full reign over a population of thirty-odd and a half toys. Here is a kingdom with bastions of wooden bricks, fortified with an army of toy soldiers and Bear, with an economy that runs on sweet-sticky treats. Here, everyone is a King and Queen and Minister all in one. Here too is where the not-quite-adults-yet family members loaf around. The kids will always be 'annoying', but better the annoyance of happiness than the silence of somberness. Occasionally, Yerenwen, Kai or Jorgey will peek in, make sure the castle is still in one piece, the army is unscathed (one wooden one with a missing leg was enough damage as it was). But the soldiers are smiling even in defeat and the royalty still safe on their brightly-colored thrones. One of the in-betweens will nod in acknowledgement, toss a little wave even. Then the elder member will smile and close the door quietly as to not disturb the monarches. And the children, they play on. The youngest in the family, Freedom is one of the original House pets and has watched his family grow larger and larger. Constantly demands attention from everyone, he secretly just wants to remind everyone that he is, in his own way, important to this family as well. 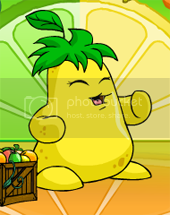 Freedom is second-ever pet on Neopets and the first pet I adopted from the Pound. I really liked the name and while I wasn't all that keen on the color, I figured I would paint him a different color one day. I can't quite remember the date, but I likely adopted him in late 2003. He remained a Yellow Uni until some time in 2004. Sometime during this period, I thought it'd be nice to paint him Baby to match the 'Colt' in his name. My friend, Stephanie, wanting to get the Hidden Tower avatar, promptly bought a Baby Paint Brush, got the avatar and sent the paint brush to me. After I got over the spazzing and surprise (yes, I spazzed even as a kid), Freedom was quickly trotted over to the Rainbow Pool. There, he became the Baby he still is. special shoutout: To Stephanie for gifting me that Baby Paint Brush back then - thank you! Freedom came to the House with Yerenwen and Kai when it was still a shell of a shelter, devoid of any remnants of life and warmth. Wanting to be useful and helpful, Freedom did all the chores and the cleaning up he could while the other two fixed up and furnished the place. If he ended up making a mess more often than not, the older two wisely overlooked it, praising instead the sincere effort behind it. Under capable hands, it was not long until the House was properly, is slightly clumsily, completed. For awhile, his world was small but secure, and Freedom was contented. Then slowly but surely, like moths to a flame, the other began to drift in. Freedom happily welcomed Snowgnats and Jorgey, but by the time Creme was welcomed in as a part of the family, that initial eagerness to accept new siblings had faded into a sulky worry. Worry that he was no longer as important. Worry that he was slowly being overshadowed by the other, more outgoing family members. So the tantrums started. And they worked, for awhile - a large part of the family's focus was turned towards Freedom in trying to quiet him down. Some of the newer family members like Amastri dismiss Freedom as a spoilt brat. Older ones, like Yerenwen and Kai, merely look at each other and know better. They quietly sit with him and talk to him about all nature of things - inconsequential things, delicious things, colourful and happy things. And Freedom listens and knows that despite everything, he's still cherished. Sometimes he wants to stop making a fuss out of everything; it's more for show than anything now. Freedom's clever - he knows that much. But he's not clever enough to know how to stop. He's trying though, little by little. Snowgnats helps out since they get along well. Most of the time, he comes off as imperious now, but he considers it a victory nonetheless. Tantrums aside, Freedom is an extremely quick learner. He picks up concepts and ideas easily and is not afraid to experiment with ways to apply them. His goal is to be someone of some worth to the world one day - a big enough ambition but he's confident he'll get there eventually. More importantly, he wants to grow to be like the older siblings. Because to him, that's how people should be like and he wants to make sure he grows up that way. Interested in everything fashionable, pretty and pricey, Amastri is your average Harajuku japanese schoolgirl. Claiming to only stay at the House because it's closer to the shops, behind Amastri's loud and bold appearance lies a person who only wants to be loved. 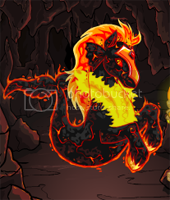 Her story: In August 2010, my labpet, Ssupppers zapped into a Red Aisha just in time for the Style Showdown. The 'Harajuku Schoolgirl' look did not make it into the finalists but a character slowly began to form. Eventually, the lab turned Suppers into a Wocky, but she stayed an Aisha long enough for me to vow to reassemble the Harajuku Schoolgirl look on 'lyserilia'. 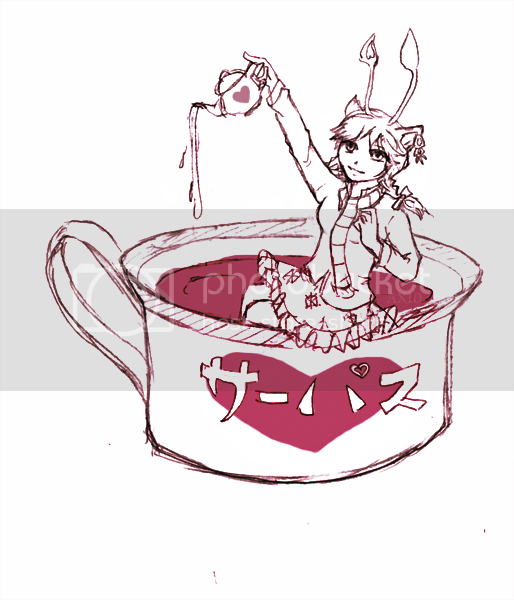 Initially, I was contemplating re-morphing Suppers into a Red Aisha. Then one night while I was lurking the Pound Chat, I noticed someone putting their Desert Aisha up for quick adoption. Upon peeking, the base of the Desert Aisha fitted the schoolgirl look like a glove and I quickly wrote out a Neomail application, not convinced I would succeed but wanting to give it a try nonetheless. I was so caught up in the schoolgirl idea that I didn't even notice the pet was a 'him'. Whoops. The owner, Casey was super-nice though and really liked the schoolgirl idea, even helping to gender-switch Amastri before offering her to me to adopt in August 2010. Thinking back on it, I was really, really lucky to have gotten Amastri - I can't picture anyone else as THE japanese schoolgirl now that I have her sitting pretty in the Playroom. special shoutout: To Casey, for generously allowing me to adopt Amastri - thank you heaps! ♥ And to Basilio, who gifted me the spunky Pig Tails Wig to make Amastri the girl she is. An enigmatic fortune-teller with Uncanny blood running in his veins, Jimmy can occasionally see into the future and definitely tell you when you will die. Initially a Blue Kau, I adopted Jimmy from the pound some time in 2006 because he was extremely intelligent (back then, 100+ intel was considered pretty high). He remained a Blue Kau until I transferred him to 'alagfalaswen' with plans to zap him into another color. I was also looking to borrow a Bony Grarrl Club for the avatar then and had a Mutant Grarrl Transmogrification Potion on hand, also for an avatar. Well, I lucked out in November 2009 when someone offered to lend me their BGC. 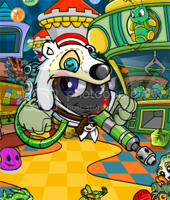 Jimmy was promptly transformed into a Mutant Grarrl and held the club that gave me an avatar, making him a double-avatar pet. If that weren't enough, Jimmy was also featured in my Random contest entry with the BGC. 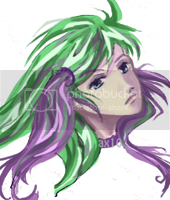 I won second place with that entry and gained yet another avatar from that. Then, on 14th November 2010, the black jewelled collar became a wearable. I took one look at the zafara model and decided then and there, I wanted a Zafara if just so I could make him wear that collar. Enter Jimmy once more. 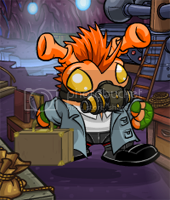 After two Zafara Transmogrification Potions (I accidentally fed him the first one, whoops) and a Christmas Paint Brush, Jimmy finally settled in as a Zafara permanently. note: For unknown mysterious reasons, Jimmy's name registers as an invalid word when I try to link the picture to his lookup. As sweet as her namesake,Creme always keep an eye out for bumps and scrapes in the Playroom. She also tries helping Yerenwen out during his baking escapades but has so far met with little success when it comes to improving his cookies. Her story Creme is the first pet I've ever traded for. 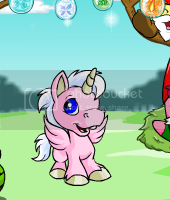 In October 2009, I picked up Apple_Joose the Ghost Ogrin from the pound to zap and was lucky enough to get a pink color-change immediately. I was going to continue zapping him while lending him out to people who needed the avatar when I stumbled across a board looking to trade a Pear Chia off in the Pound Chat. The board owner and I got to talking and he expressed that he liked Apple's name. As I was eventually going to adopt him out, I agreed to the trade. In hindsight, I'm glad I did - I like how Pear Chias look in comparison with other fruit Chias. To contrast with her independent, outspoken girls sibling, I plan to make Creme a little more old-fashion and demure, sweet and obliging. Besides, someone's got to be able to cook around here! In November 2009, Axtar's second side account, tangibilia was created. Situated in one of the hidden corners close to the Magma caves, it would be easy for one to get lost trying to find this address. For curious outsiders, this place is unfeasible, so relentlessly cut off from the rest of the world, surrounded by silence and solitude. To the other family members, it's a quiet refuge, made comfortable by the presence of those who live within. A Cave to go to when one sometimes just needs to get away from it all. To the more remote, aloof residents who live here, it is home. The third oldest pet in the family, Kaijirou runs the Cave's household. Quiet and solitary, he enjoys the peace the caves so freely offer him. With his left eye's unique vision and his fire ability, he aids wanderers who have gotten lost in the enfolding dark and help them find their way back. His story: How I got Kai was pretty simple. Right after the end of the 'Atlas of the Ancients' plot, the boards began excitedly reporting that the Guard at the Magma Pool was occasionally 'allowing' pets to slip through and into the magma, turning them into the new Magma color. I wasn't too keen on the new color at first and thought I'd give it a miss altogether. Then I spotted the Magma Peo's look off-site and...well. Within the hour, I had a brand-new Yellow Peophin and was sitting with the rest of the crowd in front of the Guard, trying to squeeze my way through. I sat there refreshing close to six hours - that was how much I wanted Kai's new color. Finally, at 8:35AM, the guard (finally!) fell asleep and Kaijirou, the Magma Peophin was created. 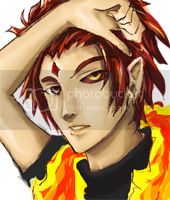 Fun fact: I derived Kai's name from the Japanese word, 'kaji' (火事) which means 'fire' and the name, 'Jirou' (二郎) which means 'second son' (even through he's the third really). special shoutout: To Chris for 'Nechikkoi' the Magmut! 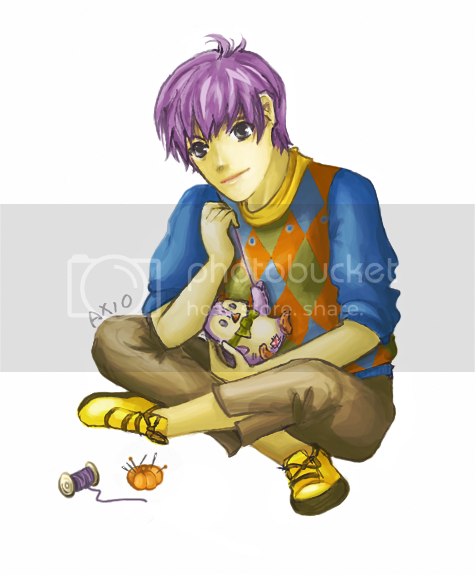 One of the House's original occupants, Kaijirou (known fondly as 'Kai') was a fairly normal child while growing up. A quiet boy, he took an interest in geology and enjoyed studying the insects and plants that grew in the garden. As the eldest then, Yerenwen took care to raise him up the best he could, and it wasn't uncommon to spot a tiny red head seated beside a smaller blonde one in the front row during one of the snowboarding championships Yerenwen frequently competed in. The first sign that Kai was not quite as normal as they thought he was came when his left eye started to redden. Despite displaying all the visible symptoms of an eye infection, Kai insisted that his eye felt perfectly fine. The hospital Yerenwen dragged him to could not find anything wrong with him either and if anything, the prescription given to him only irritated his eye. Slowly, the shade of his iris began inverting into a bright, burnished gold that burned and sparked, even as the red hue darkened. Then one night, Kai came to Yerenwen and confessed that his left eye no longer showed him the night as 'night' - through that strange eye, darkness was almost as bright as an evening ambling towards twilight. Yerenwen took it good-naturedly enough after a minor panic attack, ruffling his hair and pronouncing him 'lucky'. Freedom called him 'weird' whenever he could, but still looked up to him as an elder brother. In public however, Kaijirou stumbled and tripped, still unused to his new double-vision, for in the day, the eye shrouded his vision with darkness on his left side. Others stared - some openly, some furtively, all muttering about 'that demon child'. Barricaded behind the fierce love of a growing family, it was not too hard for Kaijirou to endure the gossiping and prodding looks he received. When he was old enough to be considered an adult though, he approached Yerenwen about the subject of moving out. He had found a place - little more than a cottage - cleverly hidden by the niches around the Magma Caves. With the vast array of rocks to study and the peace of solitude, he would very much like to make a home there. And with Jorgey and Snowgnats around, the House was becoming too small for all of them to remain under one roof. Yerenwen eventually relented and Kaijirou moved into what is now known as the 'Cave'. It was within these walls of calm that he discovered and nurtured the ability to snap fire out, wears it around his neck like a mark of his identity. Currently, Kai studies and categorizes the types and classifications of the rocks in the Magma Caves. Should he hear cries for help from travelers who have wandered down the deviously tangled tracks of the caves and lost their way, he also is all too willing to locate them and help them out - he has the ability and the heart to. To him, every one needs someone to trust and believe in. He considers himself blessed to have a whole family of them. A mysterious enigma, Ridy plays a dangerous game, double-crossing two governments and storing valuable info each other party would kill to get their hands on. He also moonlights as a fairly well-known artist, preferring simple strokes and uncomplicated designs to create emphasis and moods in his pieces. I initially adopted Ridy from the pound to get a quick avatar ('Lenny - Wicked'). I was reluctant to repound him, but, as I had not opened tangibilia yet, I did not have the space. Mankey generously adopted him to zap on her account - we've had many a laugh over how the faerie quests always seem to favor him. Eventually, I decided I wanted to morph Ridy into a dream-pet of mine - an Orange Grundo. My plans for an OG-Snowgnats was stymied by him becoming a Kiko, but I still wanted to eventually get an OG one day. Upon hearing that, Mary generously surprised me with an Orange Paint Brush. 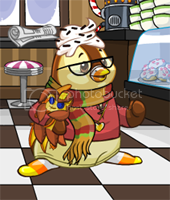 With that an a Brown Grundo Morphing Potion I bought in hand, Ridy was transformed into an Orange Grundo some time in 2009 and remains the dream pet he is today. Lithe and limber, Ridy is in peak physical condition and skilled in several martial arts, his favorite being jujitsu. The bodysuit he wears is a gift from someone who had owed him more than a mere life, enhances his natural skills, lending him a little extra in terms of speed, strength and stamina. He usually throws on a thin dress-shirt over it in lieu of pockets when he's on the job, and sees to its maintenance when he isn't. He's fairly knowledgeable in weaponry and ballistics, with a rock-steady aim. While he prefers long-distance shots via snipers on hit jobs, he is most experienced at infiltration and hacking, downloading and keeping information enough to topple small empires. 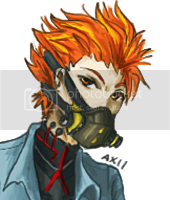 Ridy's only defining feature is a well-kept secret of his own, hidden beneath the respirator mask he's taken to using in his current persona. The respirator mask, initially a precaution against any noxious fog or airbourne poison, now acts as a thin shield, hiding the one scar linking him back to the past, and to the one man he rescued on an impulse - his dearest friend from when he was still unmarred and unmired in the business he is in now. Yunjeong may never know it, but Ridy holds the other man close as the only friend he's ever known. It's the only reason why he kidnapped the other man and forged a hit, instead of simply offing the illegitimate son as ordered. On record, Ridy's count is still perfect, still a 100% success rate. In the dark of the 'Cave' Kaijirou keeps though, lives a man bewildered as to why he's been stolen away and kept alive at all. Ridy and Kai have a agreement of a sorts, and to his credit, the other man had been quite agreeable with the sudden reluctant addition to his place. The increased rent probably helped a little. 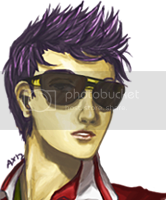 Cool and calm, very little fazes Ridy and he generally regards people in a detached, bored manner. He constantly mocks Yunjeong though, often calling him 'Princess' just to watch the other man bristle. During his free time, Ridy paints, using a set of art supplies stored in a niche in the Magma Caves only he knows. It's cathartic, and while he's no Picasso, his pieces (sent to galleries under a pseudonym) have made their way into several exhibitions, a few of which were fairly large-scale. Most admire his brushstroke and color techniques, with critics commenting on how the use of shades translates the mood on the canvas easily for the viewer. A single picture he did hangs in the Cave's kitchen, simply titled 'grasping' - it's Yunjeong's favorite art piece, to Ridy's secret satisfaction. The one fear Ridy has is that Yunjeong will one day discover the scar and recognize him for who he is, shattering the illusion that the man Ridy used to be is dead. Still, he continues taking jobs and watches Yunjeong fumble in the dark, Ridy knows he's only borrowed a little more time before the truth eventually slips out. It always does - he knows that only too well. An outcast of royalty, he was saved from assassination only because his would-be killer professed to need a pawn in his pocket 'as insurance'. Yunjeong still does not understand why he needed to die, and knows even less about why Ridy wants him to live. It must be a thing about green Lennies having all the good names because Yunjeong was originally also a Green Lenny when I first spotted him in the pound. There were no plans to take him in at first - I didn't need nor have the space for a Lenny on my two accounts and tangibilia was not yet started. 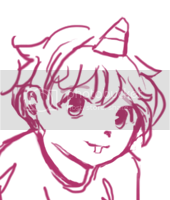 But the longer Yunjeong sat in the pound, the more I was swayed until Mary very kindly took him in as a zap-pet and kept him on her side until I finally got around to creating another side account. The creation of Yunjeong is and will remain 'utterly epic', for the lack of better words. 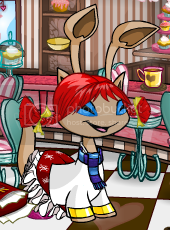 While browsing the cross-painted pets directory, I was struck by how striking a Darigan Peo would look like with Royalgirl clothing. Quickly connecting the image to Yunjeong, I then made plans to morph and paint him into a Royalgirl male Darigan Peo - my new dream pet. A peek into my bank account promised me that it would not be anytime soom though. And then one day, the crazy-brilliant group of AC Freeloaders (aka Ant, Bethy, Mankey and Vilma) sprung a surprise on me and dropped a Darigan Paint Brush and Silver Peophin Morphing Potion in my Item Event Log. Following that, a kind stranger (who is now a friend), Ben gave me a Royal Paint Brush, the last item needed to complete Yunjeong. For now, Yunjeong is waiting to be gender-swapped into a girl to be painted Royal for the clothes before he's gender-swapped back into a Male and painted Darigan. Like Ridy, I consider Yunjeong a gift from friends and am extremely thankful for him until today. special shoutout: To Ant, Bethy, Mankey and Vilma for the Darigan Paint Brush, Silver Peophin Morphing Potion and the funny message and cheer that came with them! To Ben, thank you heaps for for the Royal Paint Brush - you really made my week then! An talented plushie maker, not even Nefz himself is sure on how he ended up in the caves. Blaming his klutziness for his current circumstances, Nefz doesn't regret his change in environment, especially after discovering that Kaijirou's 'older brother' is his long-time idol, Yerenwen. 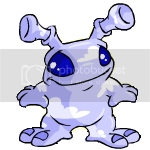 I've always had a soft-spot for Bruces ever since I joined Neopets. Knowing this, a AC friend, Katie surprised me a plushie Bruce plushie in December 2009. Its unique sitting pose and soft colors prompted me to wonder how a plushie Bruce would look like and I poked around until I found one in a pet directory. After squee-ing over how adorable and soft it looked, a new dream pet was born. Plushie pets up for adoption are very rare though. I really lucked out when I posted on Jacinta's PC board which offered to help find dream-pets that were up for adoption. Her search didn't turn up anything at that time but much later, she Neomailed me a petpage with a plushies UFA, including a plushie bruce - Nefz. Needless to say, I didn't think twice about contacting Nefz' owner, Pepper to get her approval to apply for Nefz. Nefz's application was the first petpage app I had ever made and was incredibly fun to work on. 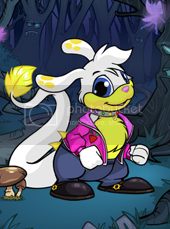 Nefz's character and interaction with my other Neopets came easily - I had planned for my future plushie bruce to be a plushie maker and Nefz's cute name prompted the additional details. I was celebrating a friend's birthday on the boards when Pepper NMed me, informing me that I'd be allowed to take Nefz back to my Neo-family - talk about adding to the cheer! Nefz will eventually be moved to the House but in the meantime, Kai's pants are looking a little less ragged. special shoutout: To Pepper for allowing me to bring Nefz into this small Neo-family; thank you! ♥ And to Jacinta, who was kind enough to NM me and get the ball rolling.